Grey styrene (11 sprues) Clear (1) and (2) Photo Etch sheets. The rush of soft skin markets to the modelling market place has seen some improvements in quality and some making time from other manufacturers. The date is 2013 and people are demanding a lot more from their modelling experience as they try to emulate the masters they see and their works at model shows and in the press. 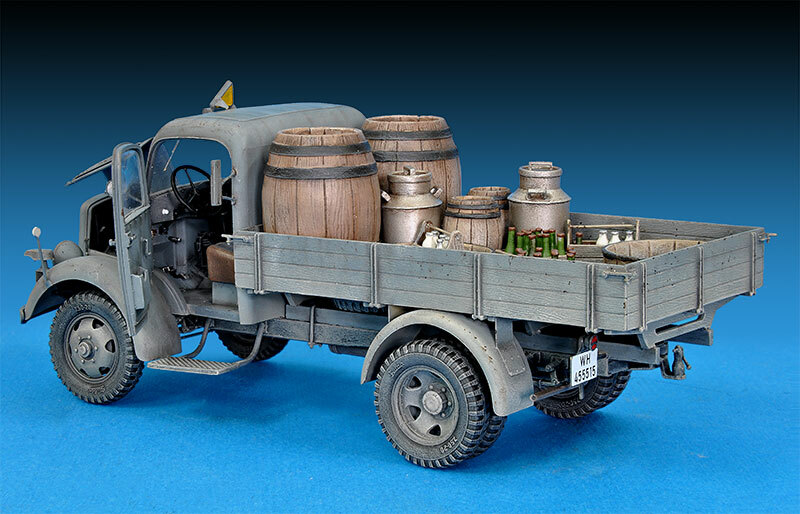 Dragon is notably the industry leader in many part/ lots of options/ many outcomes kits and have led the way from what we all seemed to grow up with – the Tamiya white box simple kit – into the 21st century to complex works of art even before they are painted. There are still those however who want just a simple build – simple and satisfying – so how do you please both while making your models more detailed than your competitors? That is the question. 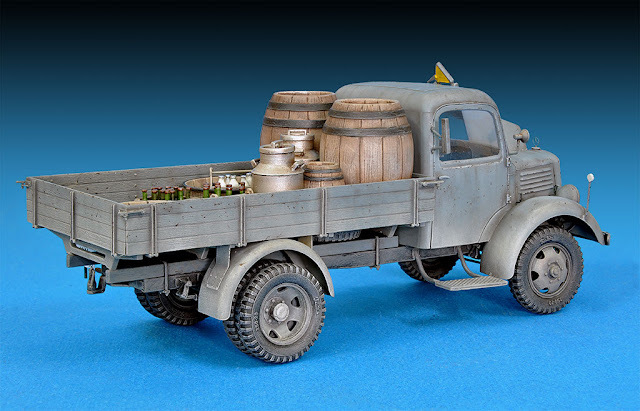 MiniArt has an answer – their latest set of kits that are built on the Steyr L1500 chassis. They have a staff car, a transport car and now a small truck based on this platform of chassis. 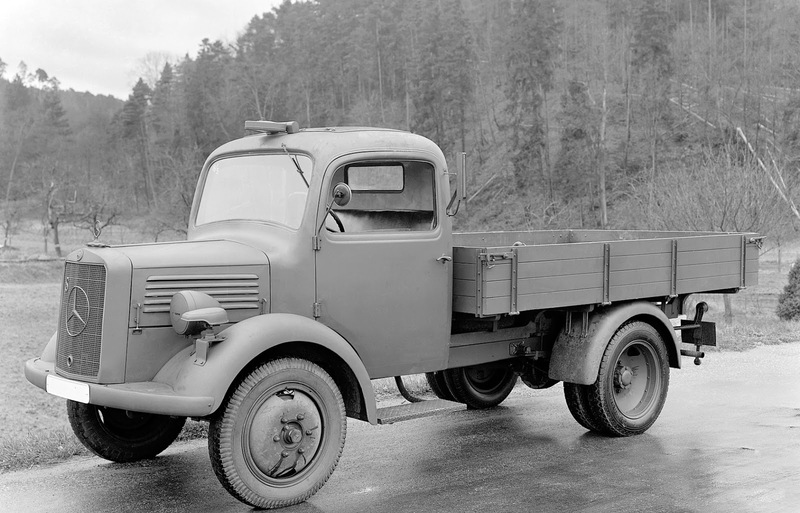 This one is the L1500 (1.5t) 4x2 Truck. 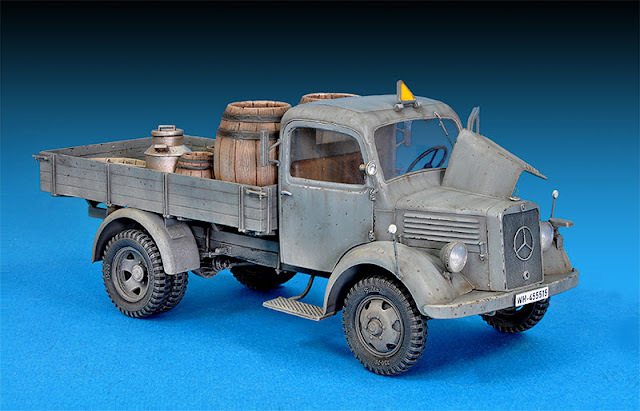 Dinky in size this model is dwarfed when held in comparison to even small trucks like the Opel Blitz – it is a handy little workhorse that looks like it could give a good contrast to the larger German tanks everyone seems to love. The 1.5t comes in a medium box full of eleven sprues of grey plastic, a clear sprue for the transparencies and two photo-etched brass sheets for the thin – and very small parts too hard to replicate in plastic. 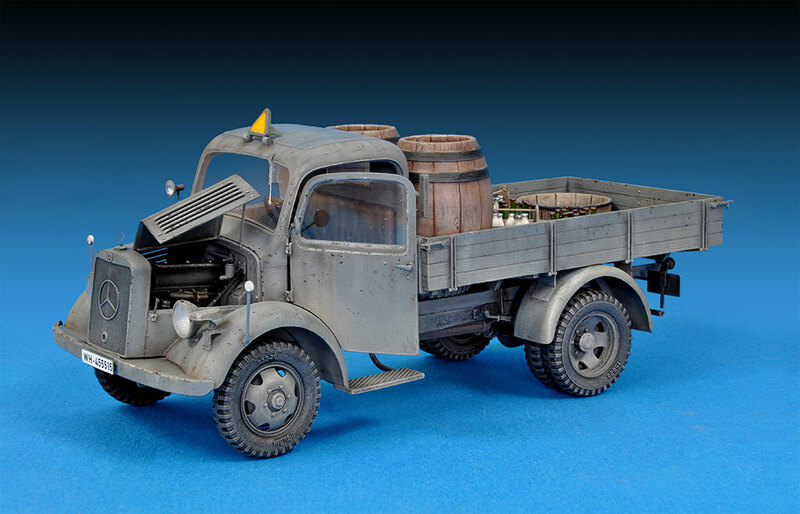 The plastic is easy to cut and work but is not flash free especially around the seams of the cab and on the extra sprue which is the stowage in which there is a fair bit of stuff for the back of the truck – that however only needs a clean-up with a knife – no biggie. The clear windows are thin but not too delicate – I haven’t installed them here as I want to paint this vehicle with them out. No blemishes of fouling or over-thick plastic here. The decals are enough to cover two cargo trucks – two number plates are included with vehicle markings for one African truck and one German grey style vehicle – though the colours I'm sure could change these are the variations that are given. Printed by Begemot these look to be in register but the whites are slightly creamy. The two PE sheets are sometimes the substitute for a plastic part and are sometimes the option. The main areas you will see of these are the radiator grill and the mudguards and the front plate to blank off the front fenders. The other parts could be left off in my opinion. Some parts really are just too delicate on this kit and the build would be a little easier if you left some of them off. Also plastic/fingers and superglue aren’t always the best of friends. Having some of these smaller parts is great if you have the time – but this isn’t a kit to be rushed. One of the best uses for the PE in this kit is the front radiator grille – the original plastic is totally acceptable, but the PE version with accompanying large Mercedes logo is worth the effort – especially if you want to display yours beaten up like I did. On to the main sprues – in whole and in detail…. 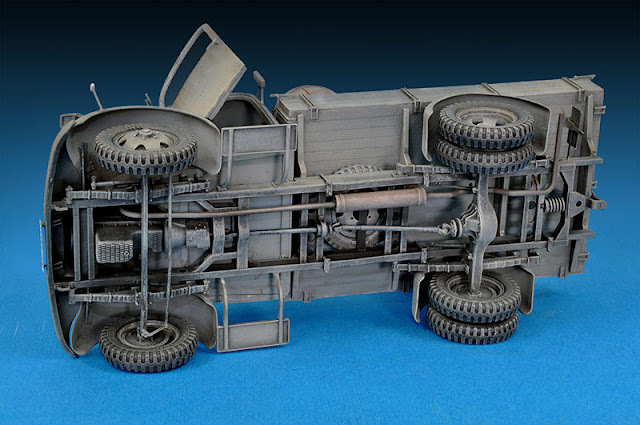 This sprue features the main parts you will see on the truck – the inside cab and seats, a rear tray and main chassis as well as the dashboard. The dash has to be painted and dry-brushed – a few dial decals would be nice here – but you can source them elsewhere if you are lucky and have a stash. The seats are a loose leather looking two part affair. It looks like someone has been wearing the hell out of them. If this texture is too much then just sand them down flatter. The tray fits together very well and has a nice and fine texture on it I like very much – to me the effect is just right – again of you do not like this get out your sanding block! The doors have inside and outside parts – the windows slip inside these and there are four tiny handles to match – aren’t we missing window winders in this case? Fenders are thin enough to pass muster and with some effort could be bent out of shape a little if so desired. The one part main cab is strong but thin. There was a nasty injection mark on the top that I could have done without but otherwise, it fits very well with the structure. There are some seams to be sanded off as well. These sprues contain enough wheels and some spare to suit this truck as well as the other side leaf spring and the access step for the truck. The tyres are easy enough to put together – they all have an extra location pin on them that should be cut off before they fit as snugly as they can – even without glue! There are some nice lettering on the tyres as well which will look great under a dry-brush. This part of the kit is released by MiniArt as a separate kit and so isn’t quite of the same quality – there is a little more flash on these two sprues which make some pretty passable barrels, milk churns, tool boxes and boxes full of different sized bottles. It is a great addition to the kit nonetheless. With the two spare tyres this truck is soon full of stowage – free stowage I might add! The largest sprue in the box this is where all the work is in this kit – I spent just as long on it as I did on the rest of the vehicle. Though the end result is well worth it especially if you want to show this truck off under repair – or even heaven forbid blown onto its side! The engine block and internal radiator look very good and are free of extra material to be trimmed – this basis of the engine assembles very easily. The detail of the engine is several parts which are tiny but essential to the real detailed look of this tiny engine. Fan belts and fans, fuel pumps and the undersides including gearbox and shock are all here in very nice detail and pretty clean of flash which often haunts these parts. Bonnet is an open or closed affair (great to show off that engine) and the see-thru grilles on the side plates are great. Through the bonnet you can see the engine this is the end result is crying out to be super detailed and painted and weathered up – definitely worth the time spent. 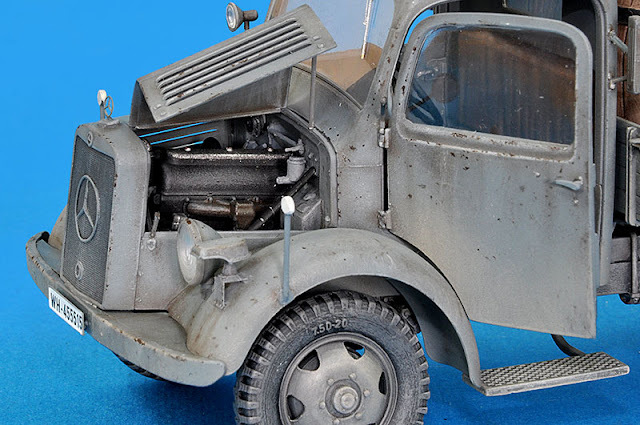 The chassis is far from the simple affair of the old Tamiya kits but as well it is light years ahead of those efforts in the detailed look of the finished product. If you do not want to see underneath or the exposed engine though and do not want to make this sort of detail and take this time then I do understand this is a lot of work. I like this result better though. The engine firewall is very detailed and can be assembled with the bottom of the inside of the cab as one part. Pedals, a handbrake and a gear knob along with the seats make this a great looking interior. The cab slips on very easily and fits here all as one unit that can be kept separate from painting at the end if you wish. Test fitting of the doors let to a good fit here – Delicate side parts and the lovely thin PE windscreen wipers should, however, be left off till last – they broke many times for me. The gap in the door isnt there after proper assembly by the way! And cab on top…again this whole part can be removed and put back on easily – nice engineering – a little like a real one I suppose. From this the PE Mudguards the tray and tyres are added and voila! The truck is complete. Most of the work of this model is in the detail underneath and engine. This can be a hindrance but I think a lot of modellers will like the result the longer time of the build takes away from them. Is it too much minute detail? Well, you be the judge of your own modelling philosophy – simple or complex - quick or a long build - you are your own council there. I think this is an excellent kit with a what I thought might be maybe few too many small parts that in the end turn out to be well worth the journey. It builds up to a great little busy kit with many possibilities – I like it very much and yes it was a fun build! A few pictures of the kit that MiniArt have painted to make your mind up for you..